​This disease has been reported near West Lafayette and in Wanatah Indiana. Powdery mildew of tomato can be recognized by the white fungal colonies on both leaf surfaces (Figure 1). Occasionally, stems may also be infected. Severely affected tomato plants may have leaves that turn chlorotic and necrotic. Fruit will not be directly affected. The causal organism has been tentatively identified as Pseudoidium neolycopersici, formerly Oidium neolycopersici. This fungus may survive as resting structures on host material. The spores are easily wind dispersed to additional tomato plants. Development of this disease is favored by temperatures below 86°F. As with most powdery mildew diseases, high humidity allows the disease to develop; leaf wetness is not necessary. 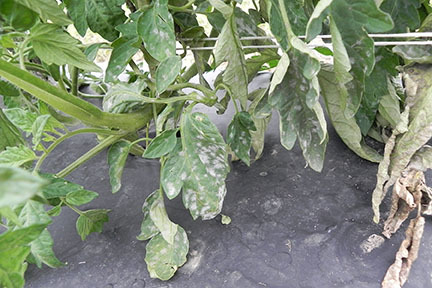 Since high humidity favors powdery mildew of tomato, greenhouse environments often favor the disease. Reports of powdery mildew on tomato are not common in Indiana. There is no data on yield loss from this disease on tomato. Nevertheless, if this disease is present, management options should be considered. Several systemic fungicides are listed as possible options in the Midwest Vegetable Production Guide. It might be useful to choose a product that is also labeled on early blight and Septoria leaf blight. An example would be Fontelis®, which is labeled for field or greenhouse tomatoes.